Super Savings Item! Save 38% on the Hey! Play!! 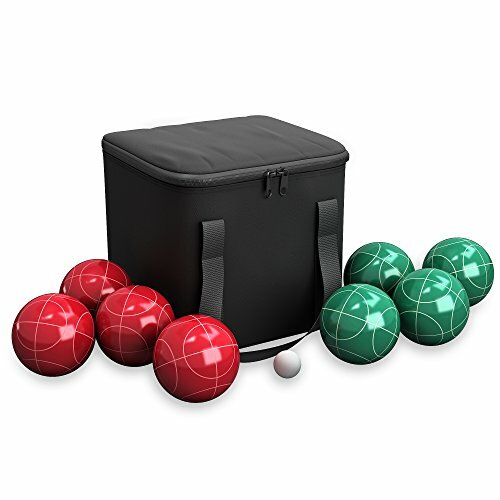 80-76090 Bocce Ball Set- Outdoor Family Bocce Game for Backyard, Lawn, Beach & More- 4 Red & 4 Green Balls, Pallino & Carrying Case by Hey! Play! at Wander Soul. MPN: 80-10602. Hurry! Limited time offer. Offer valid only while supplies last. FUN FOR EVERYONE - This go-to complete classic summer sport can be enjoyed by kids, teens, and adults. Bocce Ball is best played on outdoor surfaces such as grass, sand, or dirt. PLAY ANYWHERE - This set is easy to play on your own lawn or take to the beach, barbeque party, or to the neighbor's yard with the classic black carrier bag, complete with handles for easy carrying. QUALITY MATERIALS - Bocce Balls are made with high-quality poly-resin compound material that is crack and damage resistant for long-lasting fun, year after year! SATISFACTION GUARANTEED - Hey! Play! is committed to providing consumers with the absolute best price and value on our entire line of products.